A hammock can provide a place to chill out and relax. You may have admired hammocks in the past, the way I have. 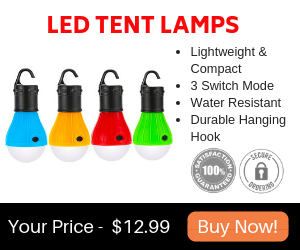 There are so many different styles to choose from but the price may get you from actually heading to the checkout. Why not make your own hammock for the fraction of the cost? There's also something special about the feeling of accomplishment when you make something yourself. I'm going to go over everything that you'll need to make a DIY hammock along with the directions needed to get the job done. Today I'll be going over three different hammocks that you may want to consider making. Because each DIY hammock is different, there will also be different supplies that you will need. Decide which hammock you want to make first, and then get started on buying the supplies you'll need. Compared to the cost of a brand new hammock, DIY hammocks are much cheaper. The cost will depend on the materials you buy, and which style you choose to make. Most DIY hammocks will not require too many materials, and any materials it does require should be very cheap. 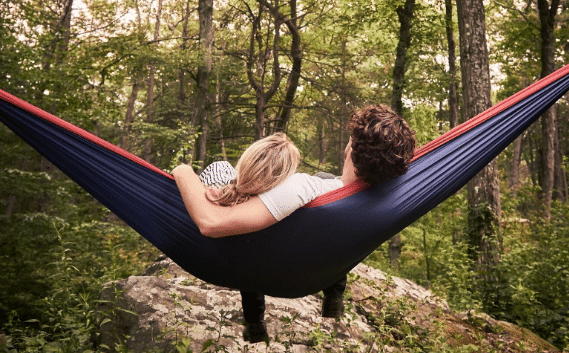 The nice thing about making your own hammock is that you can decide which design fits your budget, and you may already have some of the materials you will need. As I mentioned earlier, I'll be going over three different DIY hammocks you may want to consider making. I wrote earlier about the supplies you'll need for each of these hammocks. Now, let's get started. This is an easy DIY hammock to make. Earlier in this article I wrote the supplies you'll need. For more information on making this hammock, click here. Fold each end of the 6-foot drop cloth so that it is folded over two inches. Stitch across. Set 18 grommets along each sewn-down end. Start 1 inch in from the edge of the material. Tie one end of the 35 foot rope into a knot. Thread the other end of the rope through the underside of the first grommet, and then through an O ring. Leave approximately 32 inches between the O ring and grommet on both sides. Run the rope through the top of the next grommet, and then over and under the next two grommets. Continue the pattern until you have woven through all the grommets. Tie a knot on the opposite end. Adjust the slack on the rope if needed. Repeat the same steps on the opposite end of the drop cloth. Enjoy your new homemade hammock! This name comes from the fact that it is made from a beach towel. However, you could fulfill its name by packing this hammock with you the next time you go to the beach. Both options are available for you. 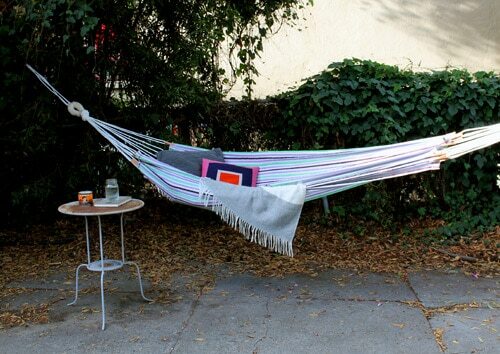 But right now I'll go over how to make this adorable hammock, and I'll leave you to decide where you want to use it. For more information on making this hammock, click here. Let's get started. Start by laying out a beach towel and cut a 42" x 80" rectangle. Fold over 1" on either long side, so that that you create a 40" x 80" rectangle. Sew up the sides. Cut two 2 inch stripes from the rectangle of muslin. Place one strip with the top of the hammock. Fold the fabric over the muslin, and pin it there. This will be your hammock's hem. Repeat on the bottom edge. Cut the leather strapping into 6 inch lengths. You need 18 of these strips (9 on each side). Fold the leather strapping in half to create 3 inch loops. Pin 10 loops each over the 2 inch hems at the top and bottom of the hammock. The ends of the loops should hit the 2″ seam. Place the hammock front side up into the sewing machine. Position the needle over the lower left hand corner of the first loop. Start by sewing one loop at a time, forming a box with a cross inside to firmly secure the leather loops. Sew each and every loop onto the hammock. Make sure to cut the extra thread on each one. Cut eighteen 8 feet lengths of rope. Loop one strand of rope through each leather loop. Fold the rope in half so the strands are 4 feet long. 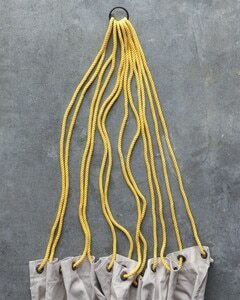 With the loose ends of the strands of rope, create a large loop and tie the strands in a big 30 inch knot. Cut the loose ends and wrap another length of rope around the loop. Then wrap thin cotton twine around the loop many times until you have a solid, thick, clean loop. Repeat on the other side. Hang the hammock up and enjoy! For some, sewing a hammock can be a difficult project. First you need a hammock sewing pattern, and you'd need to look up how to sew a hammock. Because sewing just may not be for everyone, I've included some instructions on how to make a hammock, with no sewing required! 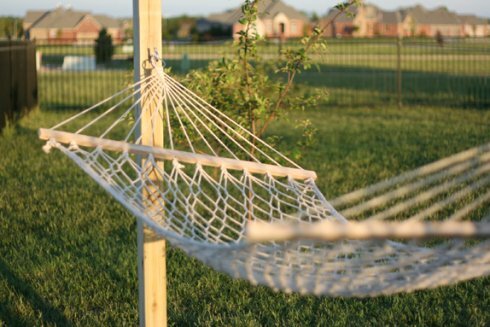 For more information on how to make this homemade hammock, click here. Fold the sheet over once. If it is a large sheet, fold it twice. Take one end of your folded sheet and gather the edges evenly inward towards the center. About 10 inches down from the gathered end, use one of your 3-foot lengths of cordage to tie the gathered end together. Wrap back toward the gathered end of the sheet about six times, and secure with 3 half-hitch knots. Fold the short end of the sheet over so that it overlaps the wrap you just made. Continue wrapping back toward the end, with at least 6 more wraps. Once you finish wrapping, secure the cordage with a minimum of 3 half-hitch knots. You should then have an eye loop in the end of your sheet once you complete your wrapping and tying. 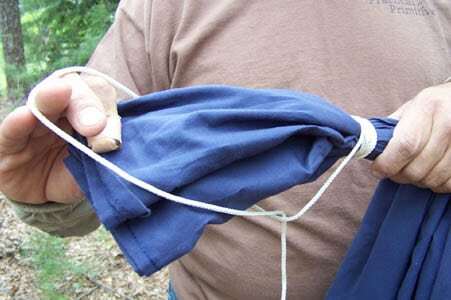 Fold a six-foot piece of cordage in half and tie an overhand loop in the folded end. Place one cordage loop through the eye of the sheet, and then pass the free ends of the cordage back through the loop so that it tightens down on the eye loop. Repeat these steps on the opposite side. Once completed, you should have an eye loop on each side of the sheet. Now you are done! To hang, tie both ends of the hammock to a tree. There are so many different hammock designs to choose from. From rope hammocks to nylon hammocks, each type is made from its own unique material, and each brings you a different sense of comfort. Not only do brand new hammocks come in a variety of designs, but so do DIY hammocks. That's why I'm going to talk about all the different designs to choose from, and which one will work best for you. Made from rope, a rope hammock has spaced holes that allows the cool summer breeze to reach you. This form of hammock is made for relaxing on a summer day, and not so much for camping. Most rope hammocks cost around $50 to $60. A homemade rope swing will cost less. Although this type of hammock may not be as durable as other types, it is still very relaxing to sleep in or read a book in. 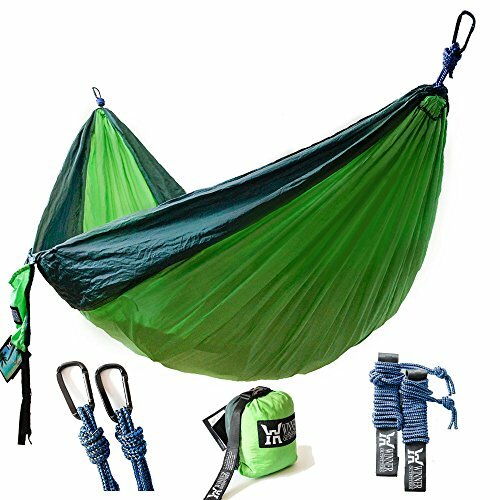 If you are wanting a heavy-duty, durable, warm hammock, the nylon hammock is probably what you are looking for. This type is what most people use when they camp, because it provides warmth and comfort even on cold nights. 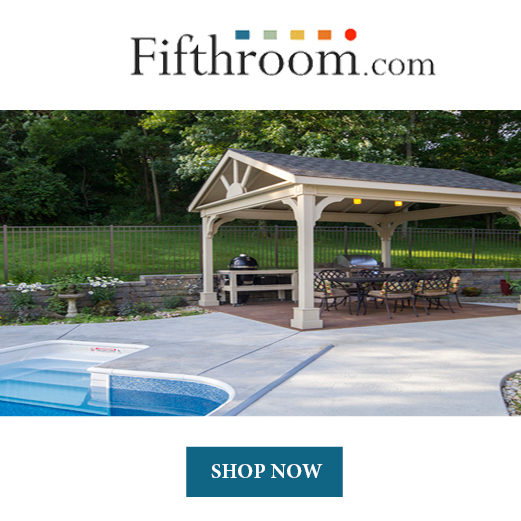 This type is also very durable, so you don't have to worry about the rain or wind damaging it. Most nylon hammocks can hold a lot of weight. Although most nylon hammocks are inexpensive, you may want to make your own DIY nylon hammock. 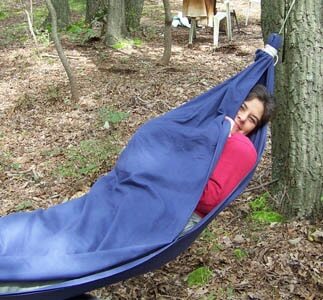 There are many ways for how to make your own camping hammock. For more information on how to make a nylon hammock, click here. Do you enjoy swinging in hammocks, but don't want to take a nap in one? You're not alone. That's why the hammock chair was created. 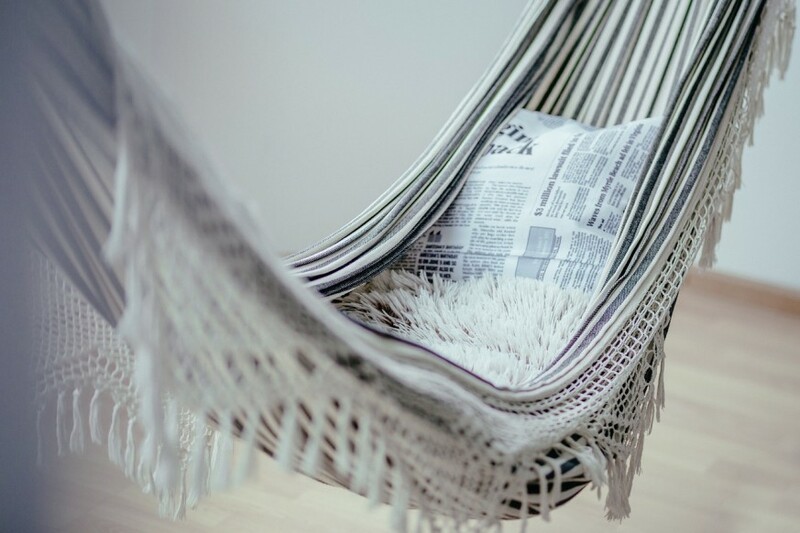 The purpose of a hammock chair is so that you can sit back and relax, and maybe read a book, yet you still have the same comfort as you would in a hammock. To make your hammock chair even more comfortable, add some pillows and blankets on it. All children love swings. That's why the baby hammock swing came into existence. 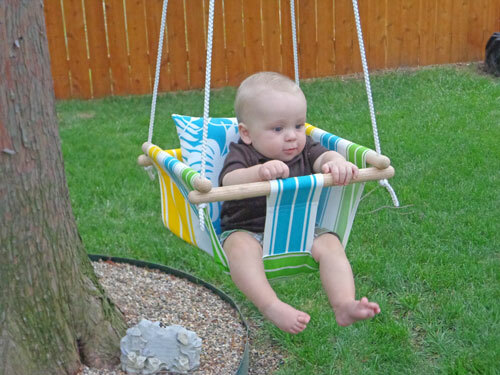 Shaped like a swing, this small hammock allows babies to feel comfortable while they swing back and forth. 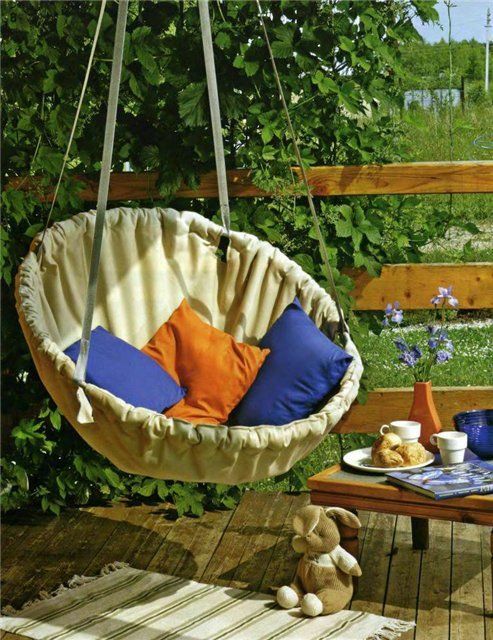 Not only can you buy these adorable hammock swings, but you can also make them. To get a full tutorial on making this hammock, click here. A double hammock allows two or more people to comfortably sit on a hammock. Most hammocks can comfortably hold two people laying down together, and multiple people sitting together. A double hammock can also be used by one person if you are wanting extra room in your hammock. Photo Credit: Little River Co.
Once you have made your hammock, the next decision is where you want to hang your hammock. 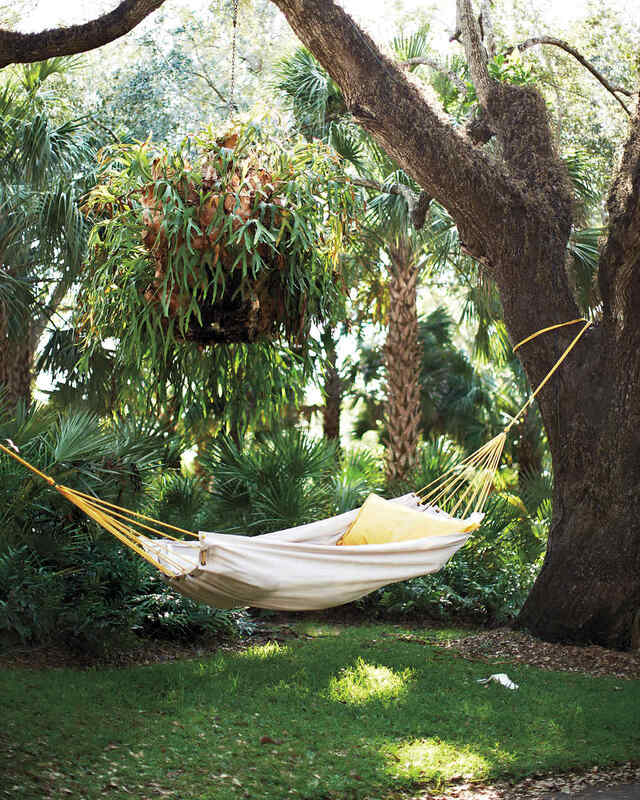 Basically, a hammock can go almost anywhere as long as it is hung to a sturdy, solid post or tree. Make sure your hammock is not too low to the ground. Also make sure the trees you hang the hammock to are not too close together. Once you find two spaced out trees, hang your hammock and enjoy summer. So there you have it. 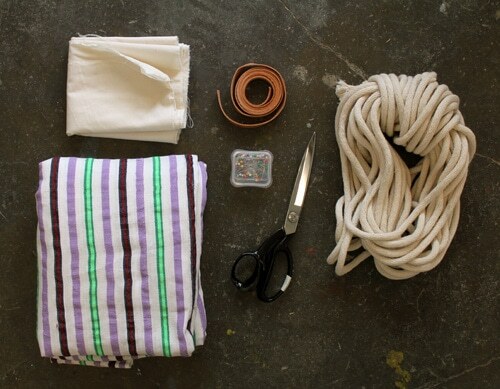 Everything that you'll need along with the know how about how to make your own DIY hammock. I hope that this has inspired you to collect your supplies and get started. 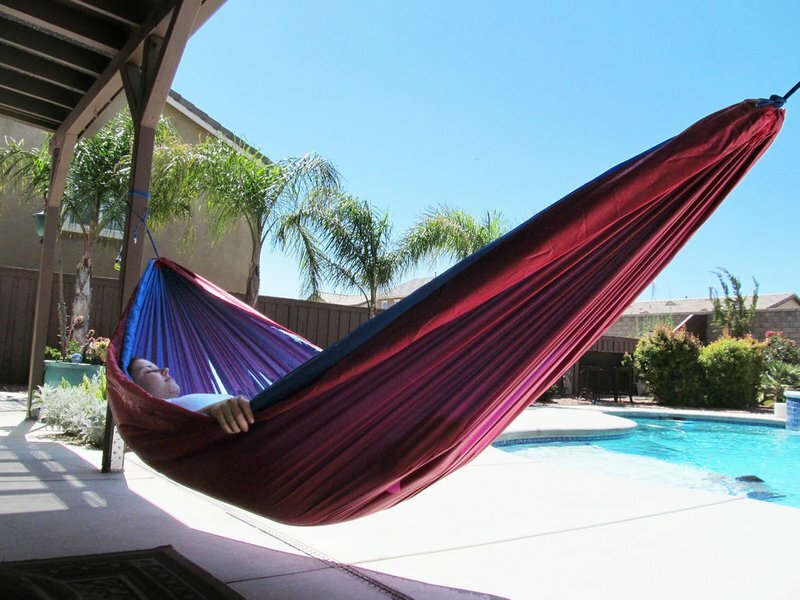 Soon you'll be hanging out in a hammock that you can proudly know that you made with your own hands.